There is free parking, and it is on the outskirts of the beautiful old city. 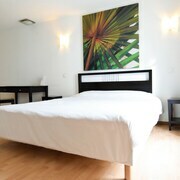 The staff are friendly and helpful and rooms have full facilities - safe, fridge, good beds. The only thing missing was shampoo in the bathroom - the dispenser soap didn't work that well. Restaurant breakfast is a good buffet. 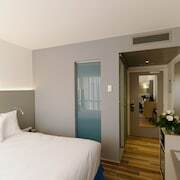 The location of the hotel is good - only a short walk from the historic part of the city where there are good restaurants, lots of shops and good connections for public transportation. 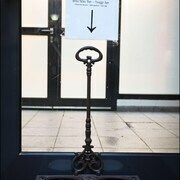 The reception staff were less than friendly, but did get things done. Where to find Saint-Amarin hotels near an airport? 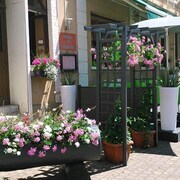 Where can I find hotels in Saint-Amarin that are near tourist attractions? If you choose to book a room near the middle of Saint-Amarin, there are a limited number of accommodations. Central Saint-Amarin has 2 Expedia-listed hotels within a 0.1-kilometre (0.06-mile) radius. 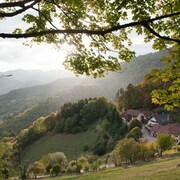 While Saint-Amarin can't lay claim to having an extensive array of accommodations right near the heart of the downtown area, Auberge du Mehrbachel is close enough to please visitors. 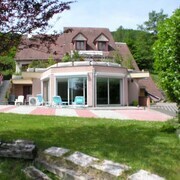 The Les Jardins De Sophie is positioned 25 kilometres (15 miles) from the heart of Saint-Amarin. Alternatively, the Château d'Isenbourg is positioned 20 kilometres (13 miles) away. 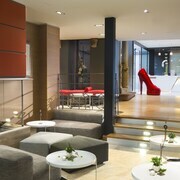 You could also check out the amenities and rates at the Les Violettes Hôtel & Spa or the Holiday Inn Mulhouse. Chalampe is 40 kilometres (24 miles) to the east of Saint-Amarin and is where you'll find Golf du Rhin Chalampe and Rhin Chalampé Golf. 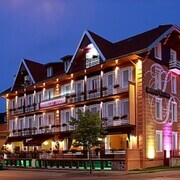 Chalampe hotels and accommodations include the Hotel Krone and Hotel am Stadthaus. 40 kilometres (24 miles) to the northeast of Saint-Amarin, you'll find Hunawihr, which is home to the Le Clos Saint Vincent and L'Hotel Chambard. The Jardins des Papillons and Cave Vinicole de Hunawihr are just some of the more popular points of interest to see when visiting Hunawihr. Before you say goodbye to Haut-Rhin, make sure you catch some local sport. Visit Zenith Strasbourg to the northeast of Saint-Amarin. 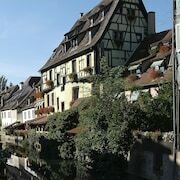 Sleep nearby to the action at the Hôtel Kyriad Strasbourg or the Hotel Kyriad Prestige Strasbourg Nord- Schiltigheim. EuroAirport is 50 kilometres (30 miles) away from Saint-Amarin. If you wish to stay nearby, you can easily secure a room at the Airport Hotel Basel or the La Villa K & Spa. What are the most popular Saint-Amarin hotels? Are there hotels in other cities near Saint-Amarin? What other types of accommodations are available in Saint-Amarin? Explore Saint-Amarin with Expedia.ca’s Travel Guides to find the best flights, cars, holiday packages and more!